I have Peaches! Alright, they aren’t big juices, luscious and fuzzy skinned Peaches, but they are peaches nonetheless. They are growing on a little twig of a tree in my front yard planted just a year ago. The poor thing still has braces, but it has enthusiastically reached out and produced seven lovely little Peaches. Now I know most people wouldn’t be impressed by this small, okay possibly minuscule crop. Nevertheless, I am in awe. First, I have a black thumb, usually killing all things green. The first three trees that were planted in my front yard died within months of their arrival. Next, this little tree really isn’t a ‘tree’ yet, more a stem with delusions of future grandeur as a tree. But still, I have Peaches! It is spring the days are lovely and growing hotter and longer. Spring always makes me happy, that short prelude just before the furnace blast of summer in Texas. I was outside picking up after the bad azzed neighborhood kids today; they seem content to leave their trash in my yard. So there I was wandering the front yard garbage bag in hand, looked up at my stick with leaves, there they were my Peaches! Sometimes it is the smallest things that make you smile. I was scared for a second. I misread the title of the blog as “Hope Impeaches”. Enjoy your peaches! Well, if I could Impeach specific members of congress at Federal and state levels I think that ‘Hope Impeaches’ might work as a title, how about it? Glad you are taking pictures. it is like having a grandchild! There are things I need to start doing again. My camera(s) cry out to me to pick them up. How amazing is that! It’s springtime. When did they grow? So you don’t get snow, I guess. I used to have a plum tree in my back yard but then I moved. Peaches are lovely to eat when warmed by the sun. This is North Texas, we sometimes only blink at winter. Snow? If the weatherman said snow during the winter it is because someone slipped him a couple of $100’s so we could shut the city down for a day. They have to have been there for a while I suppose. The tree flowered weeks ago but I didn’t think anything of it really. I would be as tickled as you to see my tree produce 7 peaches. I’m not one with a green thumb myself, but still do my best. I will share this joyous moment with you! 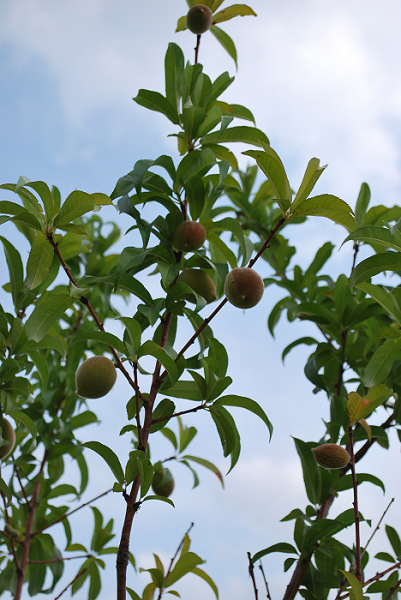 Thanks Deb – I think I will not do anything but daily go out and stare and smile at my peaches. Perhaps leave them for the birds and not even care a whit. But still, how cool is it that I have them, right? I think leaving those 7 peaches for the birds is a very thoughtful gesture. Terrific! It’s nice to know another plant killer can produce! I am capable of killing things that have tags on them that say they can live in the harshest conditions (Texas summers). So yeah, this is very cool. It made me smile.